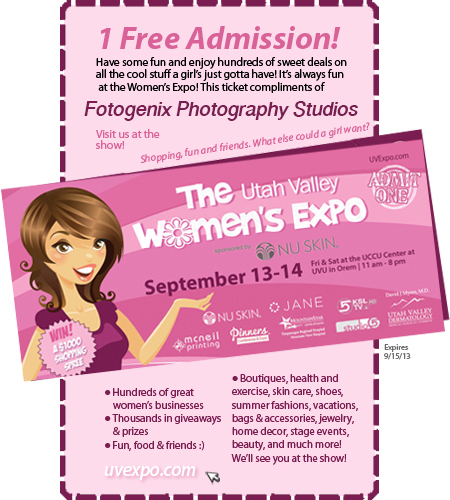 Horrocks Photography - Commercial & Portrait Photographer: It's a Princess Party at the Utah Valley Women's Expo this weekend! It's a Princess Party at the Utah Valley Women's Expo this weekend! and we are planning something amazing for all of you! FREE PRINCESS PHOTO BOOTH Ever!! We will have Princesses there like Cinderella and Sleeping Beauty to get your pictures taken with. Once they are all dressed up, and with their favorite princess, they will get their photo done by yours truly! If that isn't good enough, the Expo has given us FREE TICKETS to hand out to all of our awesome fans and followers. You can print this as many times as you need to to get all of your kids and friends in. It is going to be amazing and we hope you'll spread the word to all of your Friends. As a special note for our partners, ThePrincessDress.com will also be offering amazing deals on costumes and accessories for Halloween, and since they're at the Expo there's no shipping and they will even pay your sales tax!